Founded in 2015 by guitarist Corinne Caouette and bassist Pamela Laizure, Minneapolis-based surf-roxotica band Black Widows also includes Sarah Muellerleile on guitar and Kim Mancini on drums. Black Widows are known for their wily, surfy guitar tones, gritty bass grooves, and girl-group harmonies. Black Widows’ latest EP release, “Sounds of Tortuga Island,” explores new territory with an all instrumental, surf-roxotica soundscape that takes you to another time and place. Black Widows are currently working on a full-length album scheduled to come out in Spring 2019 and will be touring nation-wide to support it. Meanwhile, catch them at venues all over Minneapolis and elsewhere in the Midwest. Follow them for their full calendar of fall and winter shows. You won’t be disappointed! 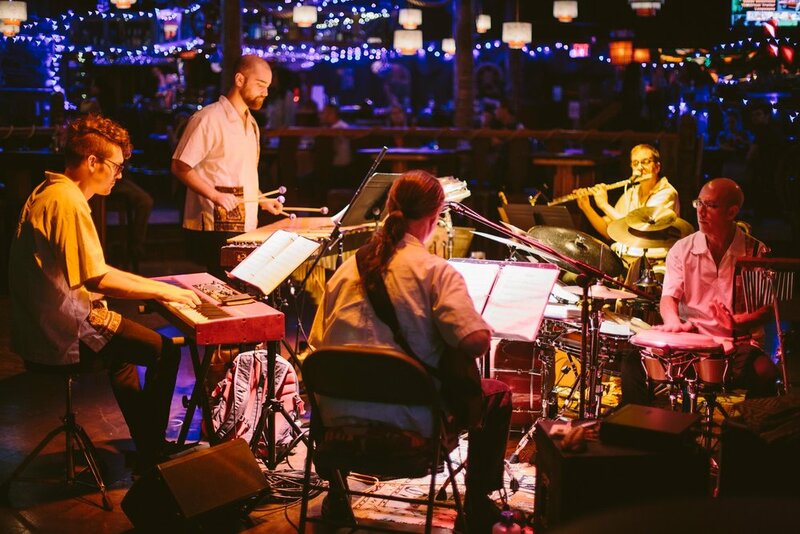 Exotik-A-GoGo is the enchanting sound of Jazz instrumentation over jungle rhythms, tropical birdcalls mixed with vibraphone, and the pseudo experience of being transported to an exotic island destination.